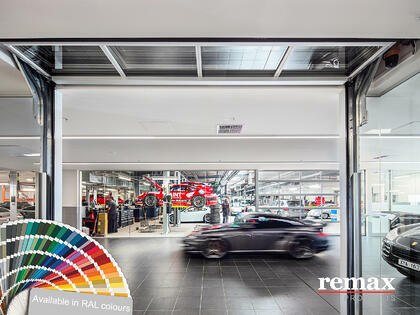 Remax Products were asked to install a Sectional Door at a Winery in Northern Victoria / NSW, the Echuca/Moama area. A family owned wine company that was established some 30 years ago in the Pentland Hills at Myrniong, Southern Victoria, since its humble beginnings, has expanded and seen substantial vineyard development in the Moama area, Southern NSW. The winery makes a range of premium table wines: rhine riesling, chardonnay, cabernet sauvignon and shiraz and is also well known for outstanding fortifieds and dessert wines. 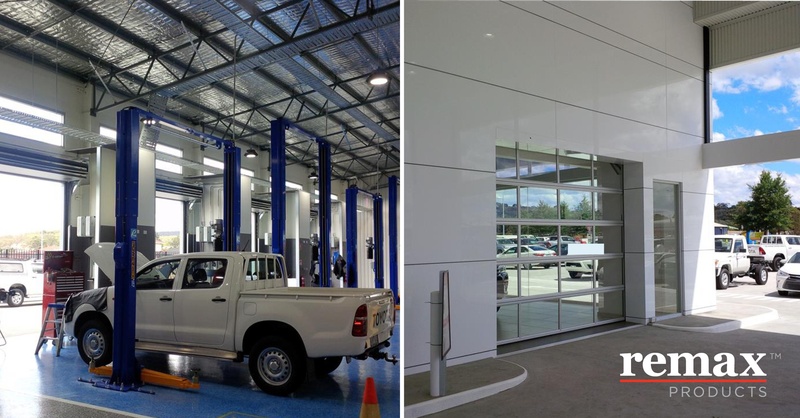 It was imperitive that the sectional door required provided insulation against the outdoor elements and provided a clean and tidy visual appeal, due to the fact that customers would be visiting site. Any winemaker will tell you that wine is especially vulnerable to fluctuations in temperature and when it comes to storing wine, poorly stored wines may not retain their original freshness and will most likely develop faster and less predictably than bottles that have enjoyed a constant, steady maturation process in a temperature-controlled cellar or wine cabinet. It is always best to store wine in an environment that minimises temperature variation. This is where the Sectional Door shines. The door was made with RAL insulated panels with an insulation value of EN12428 (panel: U=0.76 W/m2K). Since the Compact Sectional door is not your standard counter balance sectional door - the ceiling space is not impacted with unsightly (internal) overhead beams which would otherwise detract from the building design. As a more efficient, space saving and favourable option to the standard and cumbersome folding glass door or overhead sectional door. To Reduce Operational Noise. The Compact Sectional Door is a high quality alternative to standard Roller Shutters and have a number of benefits, one of them being their quiet operation. Consider this; we recently carried out a noise assessment here onsite and found that a standard roller shutter screamed in at 77dB* whilst our Compact Sectional Door whispered in at 52dB. Read our full assessment here. *The roller shutter which we tested onsite was relatively new (roughly a year old) and older roller shutters tend to be noisier if they are not well maintained. If you test some older roller shutters, you may find that they can come in at 85dB for example. Traditional overhead sectional doors require wall space and ceiling space to allow the door panels to run up and under the ceiling. The tracks are often supported by unsightly bracing and ceiling supports. And, the lifting shaft and springs are all exposed, adding to an unsightly look in an otherwise clean, modern environment. The Compact Sectional Doors have none of that. By contrast, they’re neat, free of any exposed springs, and compact! Their small footprint and compact design meant that the entire existing electrical and lighting infrastructure in the new facility remained undisturbed. 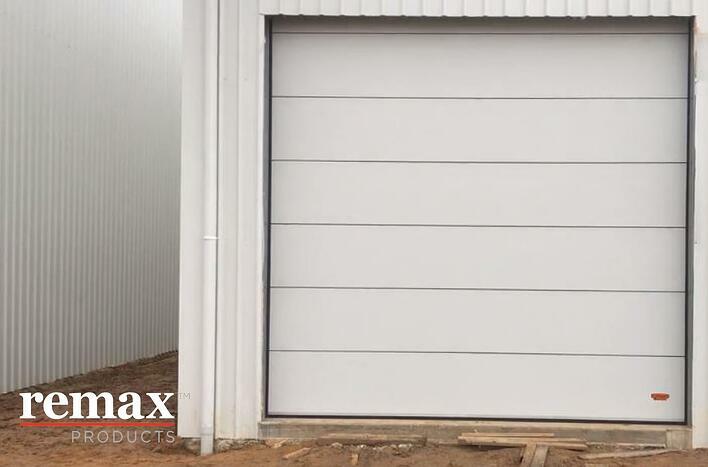 The Compact Sectional Door panels fold together above the entrance while opening, and saves not only space but is also very easy to operate and are maintenance friendly. As a smart, exit / entry point. 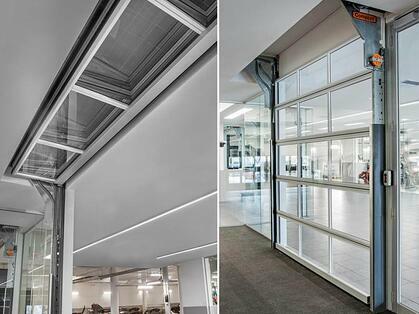 Insulation properties which cannot be matched with a standard roller shutter oroverhead sectional door. 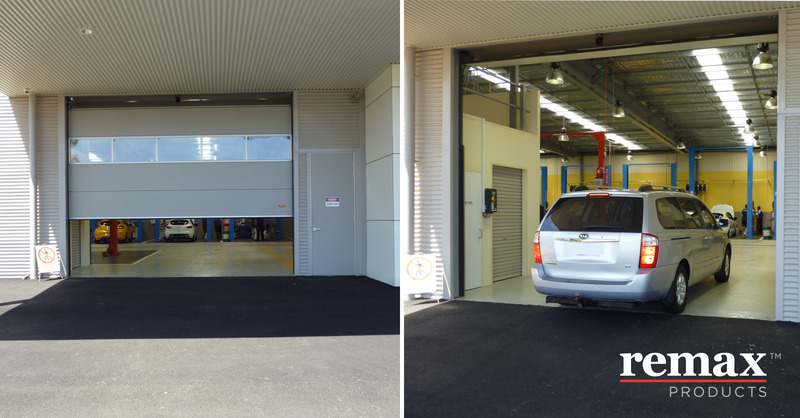 Compact Sectional Doors offer not only a great look for your facility, but also convenience and usability for a range of vehicles and equipment. Not only is the Compact Sectional Door favoured by Architects due its versatility in appearance, aesthetics, and design freedom, but it is also favoured by many builders as the roof space can be fully utilised without impacting the door both in open and closed state and also means that the compact door can be neatly recessed into the ceiling, when in a closed position, for a better showroom design. On a side note, another option available to the Compact Sectional Door is is for a double-glazed glass panels. Compact Sectional Door in operation at the winery in Moama - From outside. Compact Sectional Door in operation at the winery in Moama - From inside. Notice how quiet this Compact Sectional Door is. This particular door, in the video, is around 4.5m x 5m - so it is fairly tall! The Compact Sectional Doors from the undercover corridor show the car servicing area and the natural light flowing into the area. 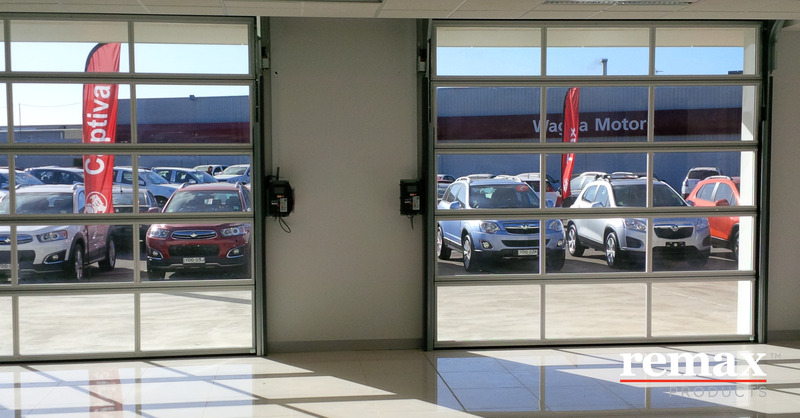 Glazed, glass, full vision Compact Sectional Doors were installed throughout the redeveloped state-of-the-art car showroom facility.